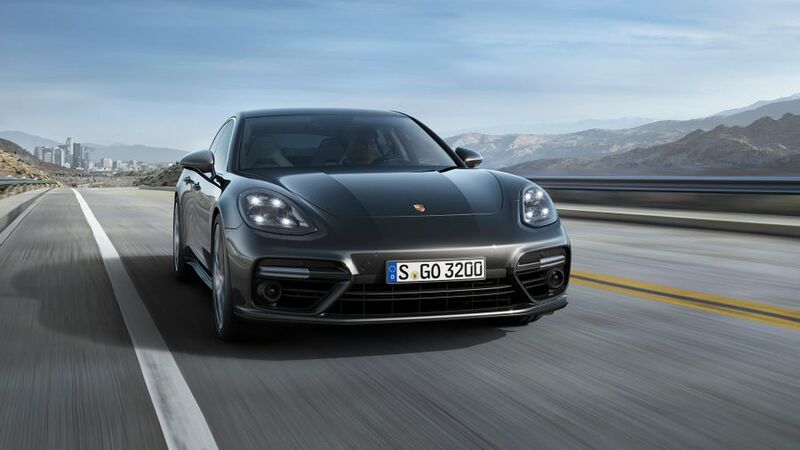 The Panamera is a car that brings Porsche’s strong sportscar heritage into the luxury saloon market. That makes it an alternative to the likes of the Mercedes-Benz S-Class and the BMW 7 Series, but also to sportier offerings like the Aston Martin Rapide S, Maserati Quattroporte and Mercedes CLS. The Panamera does an excellent job of treading the line between comfort, luxury and performance. Although not as soft and wafty as an S-Class, it’s roomy and supple enough to whisk VIPs around in the back without complaint. But it’s also steeped in Porsche DNA, which makes it fun and engaging to drive when the road opens up. The Panamera takes strong inspiration from the 911 when it comes to looks, and that’s no bad thing at all. The sloping roofline of the silhouette and rear lights are particularly reminiscent of Porsche’s iconic sportscar, and the effect is very purposeful – like a stretched 911, in fact. The E-Hybrid models have green-tinged badges on the flanks and the brake calipers are finished in the same hue. Every model gets alloy wheels and LED headlights, with either 19- or 20-inch rims as standard, and 21s optional. Twin tailpipes appear on all models, with the 4 and 4S versions getting round pipes and the Turbo getting trapezoidal ones. The interior design is once again inspired by the 911. At the front, things are set up for a sporty feel, with a suitably low seating position. The steering wheel also has a racy feel, with a selector dial mounted on it to switch between different driving modes, as well as controls for the infotainment screen and digital gauges. A stylish touch-sensitive centre console panel replaces a number of traditional buttons. It looks like a plain piano black surface when the ignition is off, but pressable areas reveal themselves on start-up. It certainly looks cool, but is a haven for fingerprints and isn’t quite as easy to use as a more three-dimensional interface, although it becomes more intuitive with a bit of practice. In the back, a second screen lets rear passengers have their say on the entertainment. Both material- and build quality are excellent and easily on a par with what you'll find in any competitors. Despite the sportscar-like appearance, it’s remarkably roomy inside the Panamera, in both the front and the back. Rear space verges on limousine-like, with plenty of head- and legroom, and even more of the latter if you opt for a long-wheelbase model. The two sculpted seats are very supportive, but are obviously not as practical as a more traditional three-person bench. Luggage space is also reasonable, although less generous than in the BMW 7 Series and Mercedes-Benz S-Class due to the shallowness of the load area. While the hybrid model gives up some room in the boot to house the battery under the floor, it still has more than enough space for shopping or even a golf bag. So far, we’ve only driven cars on adaptive air suspension, which is standard on the E-Hybrid models, Turbo and Executive models, and optional on most of the rest. It’s incredibly effective, too. It’ll soak up most of the bumps when you want to cruise huge distances – admittedly, it’s nowhere near as wafty and cosseting as an S-Class or 7 Series, but it’s still effortlessly comfortable – but if you want to get enthusiastic on a twisty bit of Tarmac, it’ll stiffen up to keep things stable, secure and controlled. Some versions (the ones with 4 in the name) also get four-wheel drive for even more cornering stability. The fact that a car of this size can change direction so sharply is truly impressive, and the nicely weighted steering helps enhance the level of engagement; it’s a little short on feel by the very high standards set by Porsche’s sportscars, but it’s plenty for a car like this. The extra weight of the hybrid versions over the more conventional variants does have some impact on how well it handles, but it’s still very nimble. Only the car’s high level of road noise – inevitable on a car with such wide tyres – damages its cruising ability, because engine- and wind noise are very well contained at high speed. The Panamera comes in many different varieties, ranging from the entry-level 3.0-litre V6, through the 4.0-litre V8 diesel found in the Panamera 4S Diesel, to the enormously powerful twin-turbocharged petrol V8 in the Panamera Turbo models. You also have a couple of hybrid options to choose from. So far, we’ve only driven a few versions, the first of those being the 4 E-Hybrid. Thankfully, the news is positive. In electric-only mode, the acceleration is perky and consistent, and Porsche promises a 31-mile range using battery power alone. With petrol engine engaged as well – producing a combined 462 horsepower – the sprint to 62mph takes just 4.6 seconds, (4.7 in the long-wheelbase version) and the pace feels every bit as brawny as it should in a Porsche. 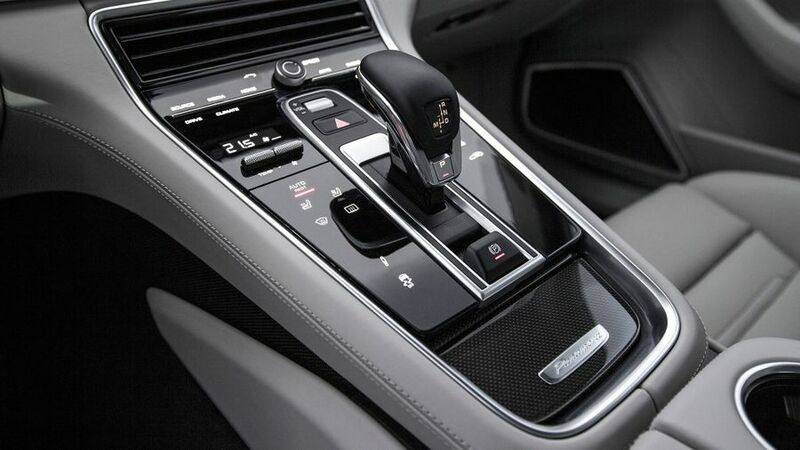 The eight-speed PDK gearbox is one of the best dual-clutch transmissions on the market, too; quick to respond and smooth in operation. We’ve also had a shot in the other hybrid, the Turbo S E-Hybrid, which combines the same electric motor with a twin-turbocharged V8 petrol engine to give a combined output of a whopping 680 horsepower. The character and power delivery is very similar but the car is quite a bit faster. In honesty, it doesn’t feel quite as outrageously ballistic as that fearsome power figure would suggest, but it certainly doesn’t hang about. The other version we’ve tried is the 4S Diesel, and again, it’s an absolute cracker. Engage the normal driving mode, and it responds eagerly yet smoothly to deliver a docile, easy-going feel. Switch the selector dial round to Sport or Sport Plus mode, and the performance becomes progressively more rabid, with faster, harsher gearshifts, higher revs, sharper responses and considerably more pace. When it’s turned up to eleven, this car has the kind of explosive pace that’ll surprise and delight in equal measure. As a luxury performance car, the Panamera isn’t cheap to buy, especially at the higher end of the range, and servicing at a Porsche dealer will cost a pretty penny, too, even when compared to other luxury rivals. However, we expect residual values to be strong. The petrol-engined cars unashamedly sacrifice fuel economy at the altar of performance, so don’t expect miracles on that score, but the diesels, although they’re still devilishly quick, have official combined fuel economy figures above 40mpg. The hybrid models promise good fuel consumption if you drive regularly in electric-only mode, but if you regularly rely on the combustion engine, your savings will take a nosedive. The hybrids also have low CO2 emissions according to the official tests, meaning numerous tax advantages, but they’re very expensive to buy in the first place. Although Panamera-specific information isn’t available, Porsche as a manufacturer sits almost at the bottom of the Warranty Direct Reliability Index, which isn’t good news at all. Having said that, the Panamera's main rivals are also from manufacturers that don’t have a particularly stellar reputation for reliability, either, with Bentley, Jaguar, Mercedes-Benz and BMW all languishing in the bottom half of the table as well. Repair costs are likely to be high for any problems, but Porsche gives a three-year, unlimited-mileage warranty on new cars. The Panamera hasn’t been crash tested by Euro NCAP, the body that gives the industry standard safety rating, but it’s reassuring to know that the last Porsche tested – the Macan SUV – scored a maximum five stars. All models come with driver, passenger, curtain, knee and front side airbags, while rear side airbags are standard on higher-spec models. There’s also an active bonnet to protect pedestrians in the event of collision. The rear seats have Isofix points for child seats, and you can opt for another set in the front passenger seat. As you’d expect, the options list on the Panamera range is sizable and capable of swallowing vast sums of money, but there’s a decent amount of kit included as standard, too. 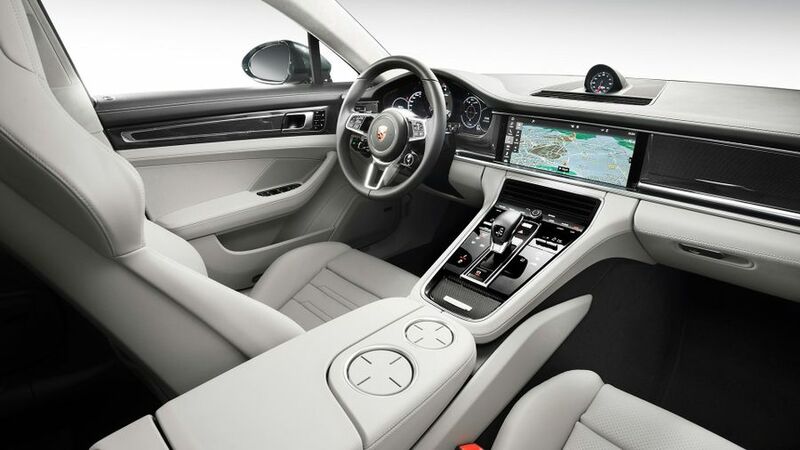 All cars get the same, impressive Porsche Communication Management infotainment system with navigation, Apple Carplay and internet access, as well as Porsche Car Connect, which lets you monitor and control various systems on the car from a smartphone app. Every Panamera also gets at least a 10-speaker sound system, while Turbo models get a standard upgrade to a Bose system with 14 speakers. Electric seats are standard, with slightly swankier ones thrown in with Turbo models. You want a Porsche, but you need to carry more than one passenger and don’t fancy an SUV. Alternatively, you want a limo-like experience but with genuine driver engagement. 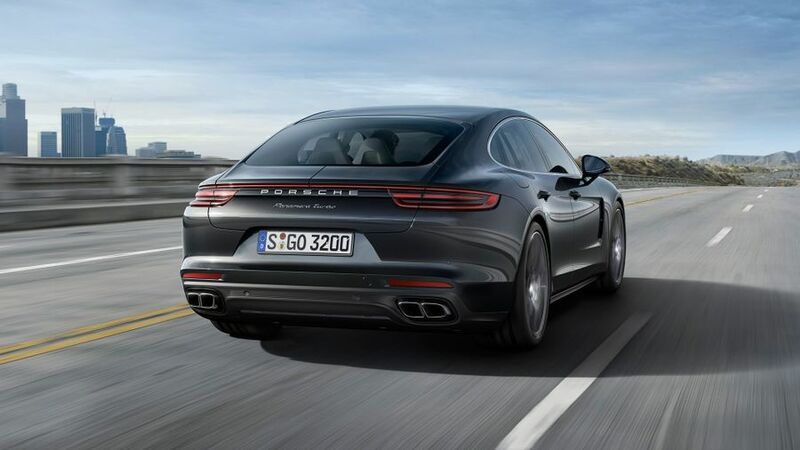 Either way, the Panamera’s performance credentials and very creditable comfort and luxury levels mean it can compete with its rivals in more than one way.